The customer-facing Loyalty & Gift Card Website allows the Loyalty Customers to access their account online and check their rewards. 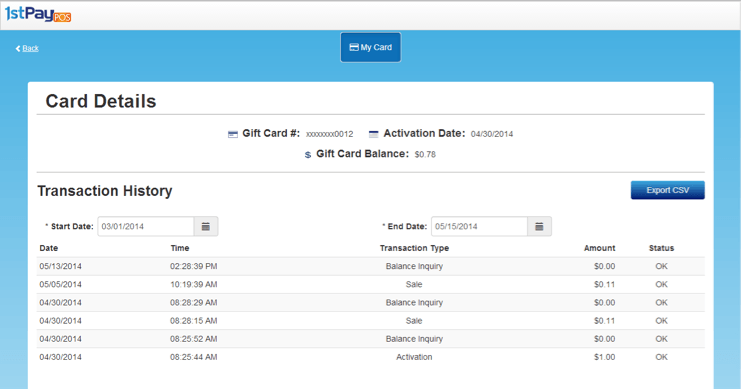 This website also allows gift card customers to check their gift card balances. After a merchant adds a customer to the Loyalty program, the customer will receive an email with the web link and temporary password to log in. If another Loyalty Customer is set up using an email address that already exists, the customer will receive an email with just the web link. The email will exclude the temporary password. Use this information to log into your account. After logging in, you will be prompted to change the temporary password received via email. Enter the password from the email in the Old Password textbox, and create a new one in the New Password and Repeat New Password boxes. Click Save Changes. You will be brougth back to the login page and must log in again, this time with your newly-created password. You will be brought to your Loyalty Profile. 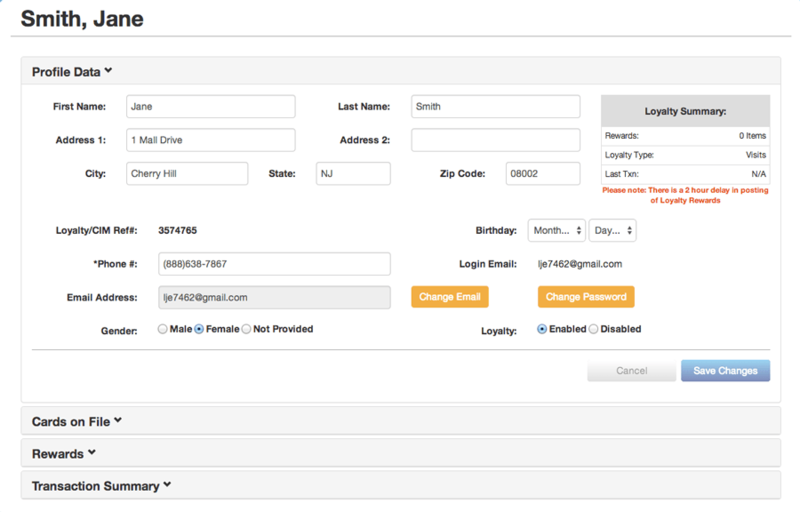 You have the ability to edit your Loyalty Profile. Click Profile Data to expand the Profile Data box, if it is not already open. All editable fields appear as text boxes and drop downs. Loyalty number,Make changes as necessary. If you'd like to change your email, click the orange Change Email button. A pop-up box will appear, allowing you to enter a new email address to log in with. To change your password, click the orange Change Password button. A pop-up box will appear, requiring the old password to be entered, as well as the new password to be typed and repeated. Click Save Changes when finished. You have the ability to add credit cards to your loyalty account, so that when you check out with that card the transaction will automatically be linked to your loyalty account. Expand the Cards on File tab by clicking its title. Click Add Payment Method to add a credit card or gift card. Click the Select a card... dropdown in the Type column, and select the card type. Enter card number, expiration date, and zip code. To view your Rewards balance, click Rewards to expand its section. Here, you can find your loyalty visits or points balance, and see how many more you need to earn to get to your next reward. You can also see all available rewards to be redeemed. To view your Transaction Summary, click Transaction Summary to expand its section. Here, you can view all recent transactions linked with your loyalty account. Enter the CAPTCHA security code seen in the image into the box labeled Enter the words above. If it is difficult to see the characters in the image, you may click Get Another CAPTCHA. You may also use the Get Audio CAPTCHA option to hear the content spoken aloud through your computer speakers. The balance and purchases will display.